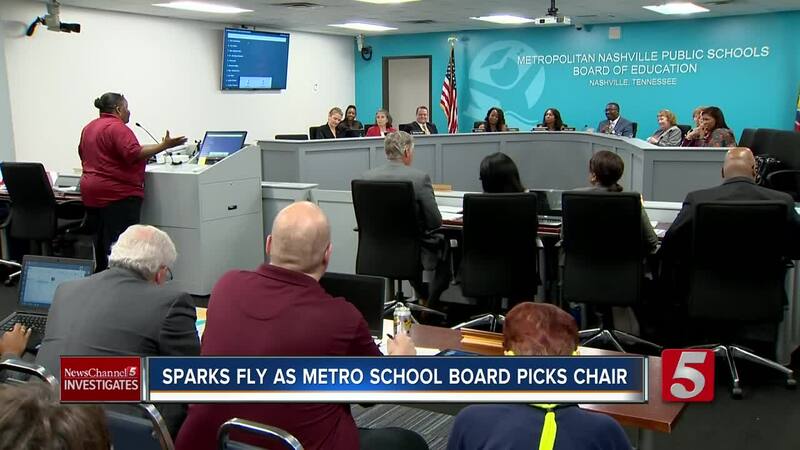 Sparks flew Tuesday night as a sharply divided Metro School Board elected the person who will chair its meetings for the next year. Veteran board member Sharon Gentry was elected on a narrow 5-4 vote despite a blistering critique from one of her colleagues. Sparks flew Tuesday night as a sharply divided Metro School Board elected the person who will chair its meetings for the next year. Veteran board member Sharon Gentry was elected on a narrow 5-4 vote despite a blistering critique from one of her colleagues. It was the first school board meeting since the election of three new members in August, and it comes as the school system finds itself mired in controversy. "Many problems existed with her leadership," school board member Jill Speering said after Gentry was nominated to chair the nine-member board. Gentry has generally been supportive of Schools Director Dr. Shawn Joseph, and Speering blasted her fitness for the job. "There are many disrespectful behaviors Sharon Gentry has displayed on the board floor -- rolling her eyes while board members speak, having side conversations, laughing and giggling with the director while board meetings are in session," Speering said. "This is unacceptable from any board member, especially the chair." Gentry's narrow victory suggests the board is now more deeply divided than ever. Afterwards, the new board chair downplayed the divisions. "There's just a lot of things that I think have been a big miscommunication, people's expectations not being met correctly," Gentry said. Among the simmering issues: an on-going sexual harassment first exposed by NewsChannel 5 Investigates -- a scandal that's had Joseph and his team dodging questions. There have also been questions about district spending. Board member Amy Frogge expressed frustrations with efforts to keep those questions from being aired in public. "I'm not sure why there would be such an effort to repress board discussion about a Metro audit and to repress questions about the audit unless there is something to hide," Frogge said. "When items of public interest are consistently omitted from board discussion, it appears the board is neglecting our responsibilities for transparency and accountability," she added. New board member Fran Bush noted that some of Joseph's supporters have tried to cast critics as being racially motivated. Race, she insisted, has nothing to do with it. "I have seen retaliation, I've seen discrimination, and I've seen racism," Bush said. "And this doesn't have anything to do with race. This has all to do with accountability." Still, one veteran school employee argued the board's divisions are not good for children. "We're here for these 86,000-plus students," Twjuana Williams told the board. "And until we understand the only reason why we have a job is because of the kids, all of this bumfoolery is going to keep going on." Some saw Tuesday night's vote as a potential referendum on Dr. Joseph's tenure as director of Metro Schools. While Joseph certainly had a solid 7-to-2 margin of support under the old board, this vote suggests that margin is now a lot thinner.